As a National Grid (formerly Niagara Mohawk) customer, you are able to participate in electric choice brought about by electricity deregulation in New York. By default, National Grid customers receive their electricity supply from National Grid, but through electric choice, customers can shop around for a retail electricity supplier for the supply portion of their electricity service. In New York, these retail electricity providers are often referred to as ‘Energy Service Companies’ or ESCOs. No matter what retail electricity provider you choose, you can rest assure that your electricity will continue to be delivered safely and reliably by National Grid, which is regulated by the New York’s Public Service Commission. 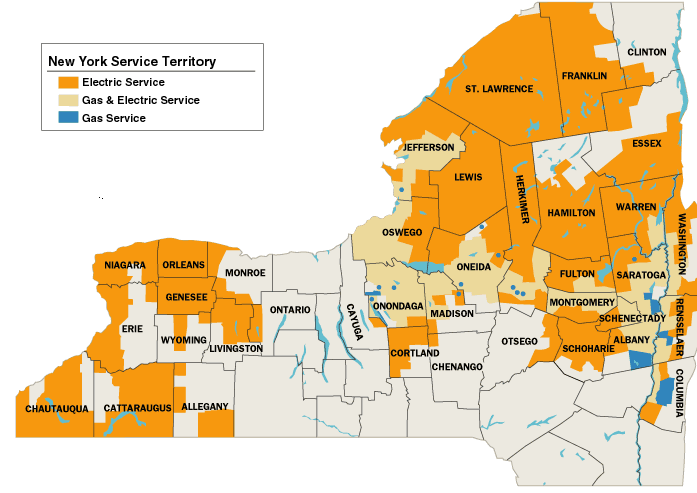 National Grid’s New York electric service territory includes all or part of the over 35 counties across the state of New York. The biggest reason for switching is for the potential cost savings. In deregulated areas where residents and businesses are able to choose their own retail electricity provider, those providers compete with each other for your business. This competition drives providers to offer lower-priced rates as well as better customer service, more customized and flexible plans, and innovative products and services. You also gain more control through the ability to choose. You can decide what matters the most to you: prices, renewable/green sources, customer service, or simply a provider whose name you know and trust. When you make the switch, National Grid will still deliver the electricity to your home as well as maintain the wires and poles that deliver the electricity. The only thing that really changes is the different rate on your monthly bill. ElectricityRates.com was established to help you make informed decisions when choosing between electricity providers and their rates and plans. Not only will you find valuable information on this website, but you’ll also find that we’ve provided a FREE Compare & Switch tool that allows you to compare providers in your service area by price and other information. To use the tool, scroll to the right of this page and type in your zip code. The tool will prompt you to select your utility, and then you’ll be able to view several providers and their plans. You can learn more about what to look for when comparing here, but the main thing you’ll want to look for is a lower electric supply rate. Your rate can be found on the second or third page of your National Grid bill, under “Supply Services”. Be sure to have a copy of your most recent utility bill on hand, as you will need your account information to switch. Once you have switched, your new provider will contact National Grid on your behalf. It will take one to two billing cycles before you see the new provider’s rate on your bill. Click here to view The New York State Public Service Commission’s ESCO Consumers Bill of Rights in order to learn about your rights as an energy service company consumer.